Abbots Langley Community Centre exists for the benefit of the people of the village and its neighbourhood. The Community Centre is home to a wide range of clubs and classes with many different interests, and also hosts social occasions and local events. It is a financially self-supporting, not-for-profit facility and registered charity. The Centre is run by a group of volunteers and users who make up its management committee, and operates in accordance with its charitable constitution. The Community Centre originally opened in 1968 as a youth centre for the village. The Community Centre has now celebrated its Golden Anniversary, having served the local community for fifty years! The Centre is held in great affection by many of the older residents of Abbots Langley who remember their time as youth club members. Much of what they enjoyed then would be banned under today’s health and safety regulations! By the 1990s, the Centre had become a much-loved venue for many local social clubs, serving the needs of toddlers and their parents, teenagers, people of all ages with learning disabilities, and older people. It had also become home to the Abbots Langley Orchestra and the BJ Taekwondo Academy. The original building was designed to last around 30 years, and as the millennium approached, began to show signs of its age. 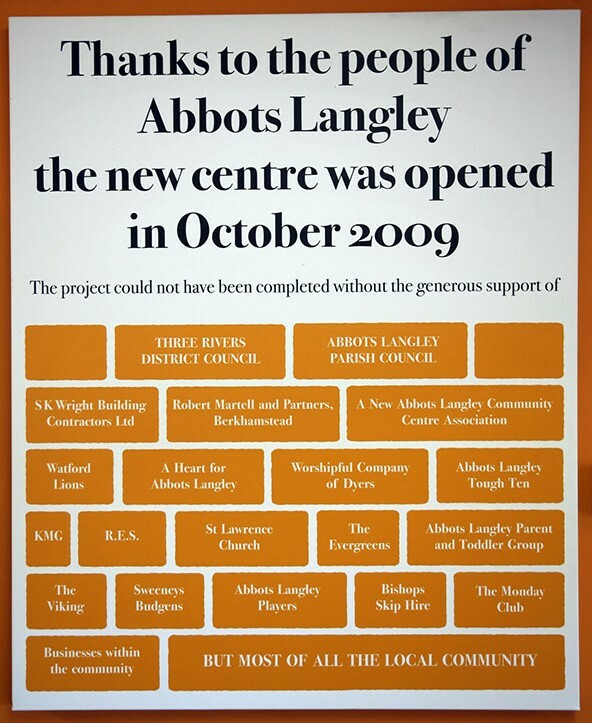 A working party, A New Abbots Langley Community Centre Association (ANALCCA) was set up, originally with the idea to raise funds for a new building. After several years of hard work by ANALCCA, a magnificent response from the community, and pledges from the Parish and District Councils to raise funds, it was concluded that a major refurbishment was the best way forward, and a £240,000 scheme to achieve this was approved. Two further years of dedicated work by the Centre’s new fundraising group, the Friends of Abbots Langley Community Centre, led to both the District and Parish Councils redeeming their earlier pledges, with the remainder of the funding raised from a variety of sources. In October 2009, the splendid building, which complements the local area, and accommodates its very satisfied user groups and other hirers, was formally opened by Graham Taylor, Manager of Watford Football Club and the England football team. A dedication panel, displayed in the Centre’s committee room, and also shown on this page, expresses thanks to the main contributors.